Seller will guarantee $135,000 in gross rent for the first year. Home had gross rent of $155,000 in 2017 and there are $138,000 in reservations for 2018 and $25,000 for 2019 already. 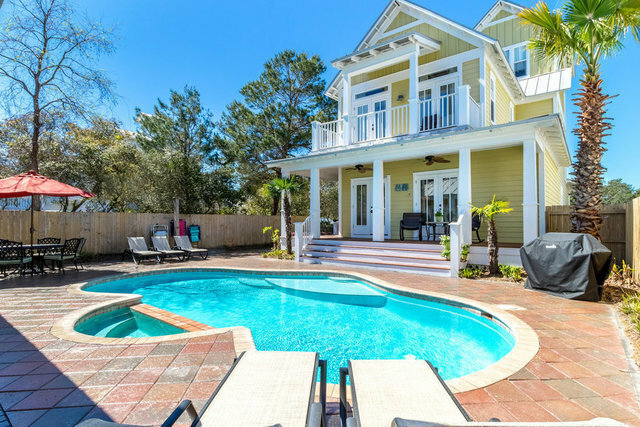 With over 77 5-Star reviews on HomeAway.com (#146609), it's no wonder this home has been recognized as ''Destin Top Vacation Rental'' and ''Award of Excellence'' by Flip Key and Trip Advisor. Home has been meticulously maintained and built to the most stringent requirements, including impact rated doors and windows. Owners pressure wash, paint and replace all pots, pans, pillows, sheets, towels and beach towels every year! This stunning 6 bedroom, 4.5 bath home sleeps 18 comfortably and has one of the largest private pools and spas (30x15) in Crystal Beach. The Aqualink System allows you to control all pool/spa features from anywhere in the world. You will find 2 of the bedrooms, a full bath and kitchenette in the guest cottage which provides for a romantic retreat. Getting to the beach is only a short walk away or use the recently refurbished golf cart that is included in the sale. Because this home is in such high demand, all showings will have to be on Saturdays in between guests.